I'm looking for some steps pads for our malibu. I would prefer chrome, and perhaps something etched in them, like the "malibu" logo, or the "W" to match the side of hte boat. Does anyone know who makes any kind of nice step pads. THe only ones I have found out there are ugle and look about 20 years old. I would be willing to design them myself in Autocad, and have them sent to a shop to cut them?? So where do step pads go, like on the gunnel or on the trailer? If you are good with acad you could draw the pattern and have it waterjet cut out of polished stainless. It wouldn't cost too much. The cost is in the patern - you just have to make sure it is completely continous with no breaks. I'm looking for ones that go on the gunnel. So when people get in the boat they don't slip and fall. We have lots of little kids running around, and just want to be safe. I can't beleive there is no market for these?! This is the extent of what is out there, pretty sad. If you wanted to line the entire gunnel with some padding (like wake girl did on her last boat) you could do the gator grip. Or, check out deck dots. Othwise, if you only want a small area I think Malibu sells their "combing" pads. 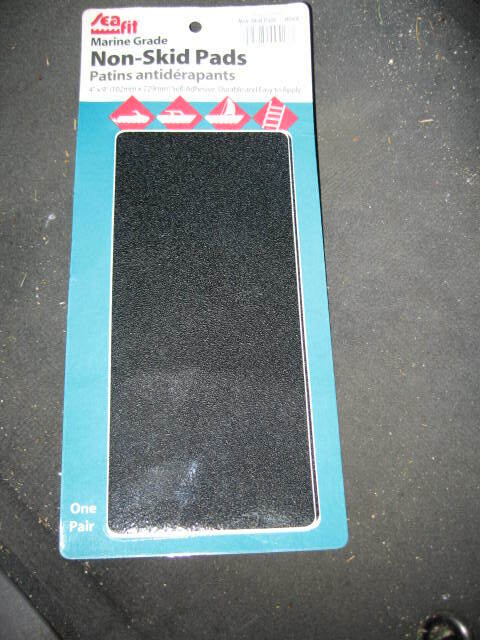 I have some 'grip tape' type pads that I purchased from West Marine that have worked out great for me. The reason I got them in the first place was because it was all I could do to keep from falling on my a$$ when getting the boards on and off the racks. The ones I found have enough grip so I don't fall, but not enough to hurt your stomach if you are leaning over the gunnel to grab something. They are also very thin, like skateboard grip tape, so you don't have worry about tearing them up over time and you can't even see that their there from the side of the boat. I'll take a pic on my way home tonight and get the name of them so you can check them out. Take at look at Dana Marine in the billet hardware section for other step pads and a lot of other nice add ons. It's possible that this could be considered blasphemy, but Correct craft re-designed theirs this year and I'm considering a set for my RLXi. Primarily because the stock Malibu step pads have square corners on them and if you habitually ski the same line length it's always catching the rope in the same place and fraying it out. Have a look. I'll try to get a picture. GT: Your rope rubs up against the top of the gunnel when skiing? I didn't get a chance to go by the boat, but this is the packaging. I have the black ones left over because I wasn't sure if I was going to put the black or white ones on. I went with white because it blends in, but my last boat had them in black and they looked good also. I ended up cutting them in half and the fit just right. We may be able to help with your needs. For a free sample please visit our site. Every time I come around and pick up a skier it hooks on the step pad. Even when a skier pulls up alongside for the stop. By the time we've talked through the pass and I pull away it's hooked. I never noticed that, interesting. I did notice what looked like fraying, but thought it the inside piece after the loop knot sticking out. Guess I need to look at that this spring. the like the ones at danamarineproducts.com, you can choose your color, or chrome, or polished. I still think mailbu needs to come out with some that have VLX, or 247 or whatever model you have and be able to put them on. Just my thoughts. Do Deckdots come in white? I did not see that offered on their site. How do your remove the OEM step pads without damaging the gel coat? Gator Grip is some great stuff! I took mine into my local sign shop and had them laser cut the design I wanted so it looks nice and clean. You can also get it at www.airjunky.com. It's been a while but at one time they had a little better price. I also used it on my transom just above the swim platform to minimize board dings. Good question, mine are not through bolted so they must be applied with some type of adhesive? I was referring to the step pad on the boat. Where is there one on the boat? On my Response, they are in the same place as the white non skid tape on your boat. thanks - there aren't any on mine from the factory, so i had no idea what you were referring to.